This blog post was written by Andrew Cannon, a research volunteer for GM1914 at Archives+. The First World War not only changed the political and economic landscape of Europe but it destroyed the lives of millions of families across Britain. This post will tell the story of one particular family whose life was turned upside down within a few short months over 1915-1916. Sadly, many records have been destroyed in the aerial bombings that Britain endured during the Second World War, so piecing together the pieces of this families jigsaw was challenging, however, there is still surviving information that can help tell their story. Joseph and Mary Vickers had three sons together. Harry was the oldest, born in 1893, Percy was born in 1894 and the youngest of the three brothers was Louis who was born in 1897. They were a working class family who initially lived in Chester before moving to Seedley, which is located in Salford. Here is a picture of the three brothers that was posted in the Manchester Evening News. The story of the three brothers starts before the outbreak of the First World War. Records show that Harry and Percy worked together on the railways, but in particular the Great Central railway. The youngest brother, Louis, worked in a shop as an errand boy presumably due to him not being old enough to work on the railways. 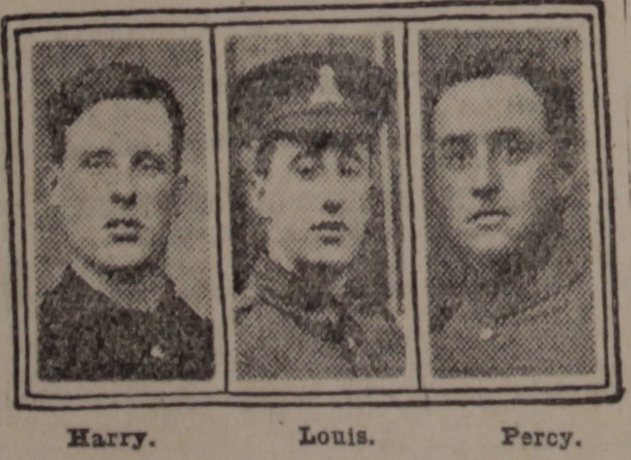 Percy was part of the 1/7th Battalion of the Lancashire Fusiliers. Records show that he travelled through Egypt during March 1915 and by mid to late April, landed in the Balkan Theatre of War. More specifically, though, Percy Vickers and his fellow soldiers landed at Gallipoli. This campaign was intended to knock the Ottoman Empire out of the First World War by securing allied naval entry through the Dardanelles to capture Constantinople (Istanbul). Gallipoli, to most in the present day, is known for the the brave contributions led by Anzac (Australia and New Zealand Army Corps) troops, which is now celebrated in Australia and New Zealand on Anzac Day which is held on 25 April. The attack, like many during the Great War led to an extraordinary loss of life of over 55,000 allied troops. It also led to the resignation of future Second World War Prime Minister Winston Churchill. Out of the 58,000 who died at Gallipoli, Percy was unfortunately one of them. On 20 December, Percy died. The story of Harry Vickers is, unfortunately, a short one due to lack of records surrounding him. He was a soldier of the the 15th Lancashire Fusiliers. He landed in Boulogne on 22 November 1915. Whilst in France, his battalion served heroically in different assaults during the Battle of the Somme. Harry died, like so many others, on the first day of the Somme. Records show that they would go on to fight at the Battle of Albert, Battle of Bazentin Ridge and the Battle of Ancre. The latter was the final assault that the British made on the Somme in November 1916. If any readers of this post know of any further information to tell the story for Harry Vickers, please comment and I will edit accordingly. Louis unfortunately died on the second day of the Battle of the Somme. My previous article examined, briefly, the Somme so for him to survive the horrific first day is something that should be commended. The War Diaries state on the second day that it was a “quiet day generally”. This arguably reflects the brutal nature of warfare and perhaps the outlook of commanders. It certainly supports sources and statements from soldiers that suggests some commanders did not care about lives of their men. Records that track the movement of Joseph and Mary Vickers after the War have proved to be hard to find. With Joseph being 51 and Mary being 48 when their children died, it is highly unlikely they had any children after the war. Again, if a reader of this post knows any more information, please comment. So within the space of a few short months, Joseph and Mary Vickers had lost all three of their sons during the First World War. 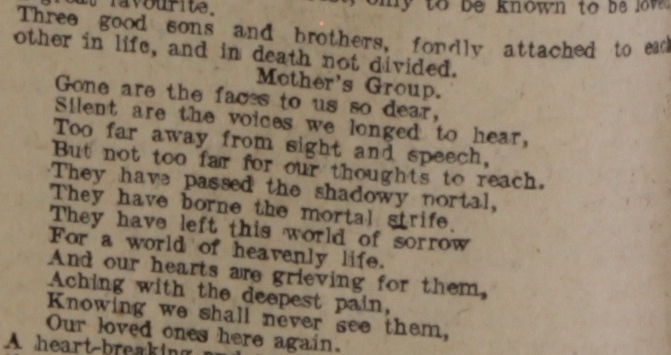 They posted an obituary for their sons in the Manchester Evening News which shows their grief and sadness. Within this announcement was a poem dedicated to their fallen sons. One can only imagine the pain and sorrow that they both felt on hearing the news. This must have been the case for many, many families not just in Britain and Ireland but across the countries who fought in the Great War.